Be the first to share your favorite memory, photo or story of Paul. This memorial page is dedicated for family, friends and future generations to celebrate the life of their loved one. 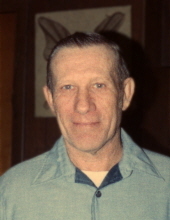 Paul Eugene Dunlap, 82, of Robinson, IL, died at 1:40 a.m. on Friday, April 5, 2019 at Brookstone Estates of Robinson. He was born October 6, 1936 in Hardinville, IL, the son of Thomas Dunlap & Jenny Marie (Spiker) Dunlap; both of whom preceded him in death. He was preceded in death by his wife Shirley Wells. He married Ruth Stotler on June 27, 1986 and she preceded him in death on September 24, 2015. He was also preceded in death by his daughter Patty Scott, and by his brother, Frank Dunlap. He is survived by his son, Tom Whitt (Palestine, IL), by his daughter & son-in-law, Debbie & Ken Pryor (Flat Rock, IL); by his step-children, John Matheney (Seelyville, IN), Scott Matheney (Albany, NY), and Dawn Kruse (Henry, IL); by his grandchildren, Stacy & Ben Maxwell (Flat Rock, IL), Billy Hall (Flat Rock, IL), Michael Stephens (Robinson, IL), Carrie Stephens (Robinson, IL), and Amanda Stephens (Robinson, IL); by several great-grandchildren; by his brothers & sisters-in-law, Harry Dunlap (Robinson, IL), Larry Joe & Anna Dunlap (Palestine, IL), Jerry & Lana Dunlap (East St. Louis), Gary Dunlap (Robinson, IL), Rick Dunlap (Robinson, IL), Jim & Chris Dunlap (Hindsboro, IL), Harold Dunlap (Robinson, IL), and Roger & Donna Dunlap (Robinson, IL); by his sisters & brother-in-law, Sally & Jim Morris (Pekin, IL) and Sharron Dunlap (Pekin, IL); as well as several nieces and nephews. Paul grew up in the rural Flat Rock area before proudly serving not once, but twice in the U.S. Army. His time in the service prompted him to join the Henry, IL American Legion Post #323. Much of his life was spent working construction, but when he wasn’t working, Paul loved to spend his free time enjoying the outdoors, be that camping, fishing, or tending to his yard. Later in life, he could almost always be found enjoying his beloved westerns on TV, and this provided him with endless hours of entertainment. Paul will be remembered as a gentle, compassionate man who lived life with a smile on his face. A graveside services will be held at 2:00 p.m. on Thursday, April 11th at the Hardinville Cemetery, where military services will be conducted by the combined units of the Robinson V.F.W. Post #4549, the Robinson American Legion Post #69, and the Flat Rock American Legion Post #132. Celebrant Curt Goodwine will officiate the service. Memorials may be made out to the American Cancer Society, with envelopes available at the funeral home and cemetery. To send flowers or a remembrance gift to the family of Paul Eugene Dunlap, please visit our Tribute Store. "Email Address" would like to share the life celebration of Paul Eugene Dunlap. Click on the "link" to go to share a favorite memory or leave a condolence message for the family.